The greatest day’s racing on earth. I’m woken early by a thunderstorm at 5 am. It’s teeming. Uh, oh! There’s 7 mm of rain in my gauge as I leave for the track, a short tram ride away. It’s not looking good. My first anorak day for the spring. I shouldn’t bet. I shouldn’t even go! But I grab the umbrella. And so it proved. Nothing made ground down the outside. The inside lane was a ride to victory. The Mackinnon winner Gailo Chop had the perfect form for a wet day. Five starts for four wins and a placing in the wet. But I don’t do form. And it had the glue-on shoes so it is obviously sensitive to hard tracks. The glue colour made them virtually undetectable. I stuck to my old favourite Happy Trails, who always looks good. My first losing Derby Day in five years. I backed Gai’s horse in the Hotham Handicap and thought I had it made with Amicus at 30/1 in the Myer Classic until she was pulled up by the going. One out of three. Home to find 10 mm in the gauge! I told you that track was off! If you are in town for Cup Week then a must-see is The Horse exhibition at the National Gallery of Victoria. They have rummaged around in their vaults and pulled out some fabulous horse pictures and sculptures. The exhibition is organised into sections depicting the social history of the horse: in mythology, as a noble steed, a workhorse, warhorse, and racehorse. My favourite? Leaving aside lascivious centaurs, attempting to carry off fair maidens, it was hard to pick between several pictures: Winners of the first twelve Melbourne Cups, 1889, by Frederick Woodhouse Senior, The Betting ring at Flemington,1887, by Carl Kahler and The Toilers, 1940, by Septimus Power were all most excellent. 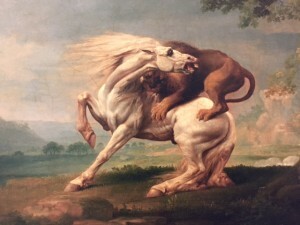 But the clear standout was A lion attacking a horse, 1765, by George Stubbs, the supreme equine artist. Nature red in tooth and claw! And fortunately I was allowed to take a photo on my iPhone with the flash off. You’ll need to get your skates on as the exhibition has only one more week to run! 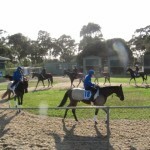 I’ve been out to Werribee a couple of times this week with Jumpout Joey to check out the international horses. 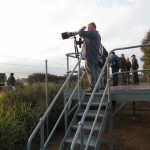 The set up is fabulous with two separate barns and good viewing platforms for the media and horsewatchers to observe the horses parading in their warm up. In one barn are the English and Japanese horses, and in the other the Godolphin and O’Brien horses. The Cup favourite Fame Game is usually the first horse out onto the track each morning and the last back in. He seems to have taken everyone’s eye which is probably why he is a short-priced favourite. 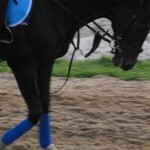 He works in bandages, a martingale and a cross-over noseband. The Godolphin horses looked good, especially Elhaame. And Aidan O’Brien’s pair, Bondi Beach and Kingfisher, were excellent. I’m not a clocker, but the best workers to my untrained eye and hand seemed to be Fame Game, Trip To Paris, Bondi Beach and Max Dynamite. I don’t get too excited about the Cox Plate these days. It seems to me that it is over-hyped as “legendary”, especially now that we have had a legendary maiden winner in Shamus Award! But it is attracting some international interest so I had a good look at the internationals out the back. Arod was pawing and nibbling on the tie-up and the strapper was smoking, which is a real no-no. The horse detested the smoke and tossed its head up put its ears back. 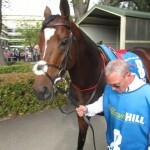 In the yard it had the cross-over noseband, and was still sticking its head up with the strapper tugging on the strap. Gailo Chop was hand-held with the ear muffs, braided mane, tongue tie, and glue-on shoes. The horse was salivating freely. 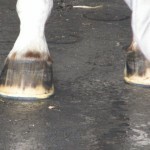 The favoured Highland Reel had special treatment with wood chips in the stall and was double hand-held as well as showing off some plastered shoes. Only the slightest evidence of pawing. In the yard there were two strappers and the horse was sweating up, despite the cool southerly, and displaying an unusual gait. It looked like the horse was trying to stamp or paw, but I finally decided it must be pawing since the knee was bent whereas it is usually straight with a stamp. Someone suggested the horse wasn’t too sure where to put its feet! With all this information…… which one would you choose? I chose none of them and went for Winx! I spent a couple of hours looking at the Cup horses in the stalls. There was a lot of interest and media focus on the internationals and especially on the blind part-owner of Trip To Paris, Andy Gemmel, stoically doing interviews. 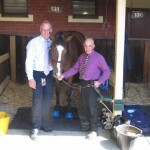 The horse looked supremely relaxed, even when cuddled by the foreman Robin Trevor-Jones! Mongolian Khan looked OK, hand-held, but I always get a bit nervous when I see a stallion chain. It was hard photgraphing horses into the sun in the western stalls. Our Ivanhoe also was hard to see, but was plastered up, which cracks a mention as a rare variable in the new book. The horse was listed as having glue-on shoes, but I couldn’t confirm it in the stall because of the sticking plaster. In the parade ring I think I missed Our Ivanhoe altogether. The first two looked good though. My final six for the cup trifecta were Snow Sky, Mongolian Khan, Trip To Paris, Royal Descent, Rising Romance and Set Square. The Japanese horses were still a bit over-aroused. 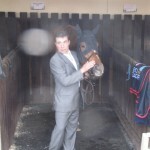 My outright selection was Rising Romance, simply because she was asleep in her stall! I lost on the cup, so you might think I had a losing day. But you would be wrong. I was still cheering on The Pumper, booting home Dawnie Perfect at $5.10 for the place! I don’t always get things right. And there seems to be an exception to every rule. My rule of thumb is that a horse must keep four feet on the ground. So any horse that is bucking, kicking, rearing or pigrooting is automatically ruled out. I make a big deal of this in the new book. And there is even a good picture on the cover! But now I’m starting to have a rethink. There have been several cases recently of horses bucking their brands off and then going out and winning the race. 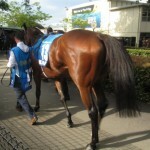 Politeness in the last race was another example. 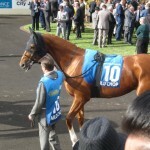 Kicking out and bucking in the parade ring, mounting yard and on the track. An obvious lay. Put your money where your mouth is. I offered $1.65 the place, with the books showing $1.55 and the tote $1.60. Excuse me, but Politeness won like a good thing. Thank goodness my bet wasn’t matched. It looks like I might have to do some more research on this conundrum. I’m still a member of the Bart Cummings school of horsewatching (vale Bart!) and like my horses to be relaxed. So only two bets for the day. Harlem River in the three-year-old fillies, that flopped into third, and Criterion, simply too good in the Caulfield Stakes. Horsewatchers have a serious advantage in the early two-year-old races and so it proved with Kinetic Design, clearly the most relaxed horse in the Maribyrnong Trial Stakes. The horse was last at the 400 but powered home to grab second at $4.20 for the place on TAB fixed odds. It’s nice to get a good start to the carnival! But then a loser in the mares with Madam Gangster although I got something back on Lord Aspen in the last. 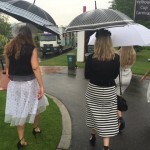 Three bets is quite a lot when I’m easing myself into the spring and just getting my eye in! 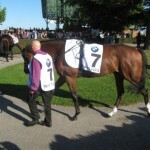 In the main race the Cup winner Protectionist was taped up on all fours and was unsettled and pawing in his stall. He ran an even race without ever threatening.